Many readers sent me this story since it went up on Arutz Shevah/Israel National News, Wednesday Morning. It’s generally not my policy to post material from or link to A7/INN because they’ve admittedly plagiarized at least two of my stories (word for word and using exact ellipses from my quotes)–and they’ve plagiarized stories from many others, as well. Besides being wrong, that’s chutzpah because my family held fundraisers for A7/INN over the years and raised them a great deal of money. Each time I catch them and call them on it, the response is an “aw shucks, we made a mistake (by ripping me off word for word without credit?! ), not a big deal (for them).” One of the times they finally gave me credit, after no-one read the story anymore. BFD. U.S. State Department-funded University of California program which provides business training for residents of the Middle East specifically excluded Israeli Jews – until Jewish journalists protested. The University of California has now altered the program’s eligibility requirement that initially barred Israeli Jews. The turnaround in policy also may have saved the State Department, whose Middle East Partnership Initiative (MEPI) finances the program, from having to provide an embarrassing explanation. MEPI also selects the participants. The Beyster Institute, which manages the program, offers three 10-day seminars, each one with 20 eligible participants. The program includes professional coaching and offers opportunities to make new contacts and “to help promising leaders realize their aspirations to build successful [businesses]… The participation of women is highly encouraged.” . . .
Israeli Jews originally were excluded despite the program’s stated advantage as “an important cultural exchange.” Fuller did not explain the initial “confusion” in barring Israeli Jews. . . . The question I have, aside from the anti-Semitic apartheid is: Why the heck are we funding business studies for citizens of oil-rich Arab Muslim countries? Why can’t they pay for their own? It’s, frankly, ridiculous to do so, when we don’t do the same for our own citizens. And even if we did, we shouldn’t be funding the citizens of countries whose people mostly hate us to learn from our business professionals. We should be funding citizens of Saudi Arabia, Bahrain, Oman, and the UAE to study business here?! 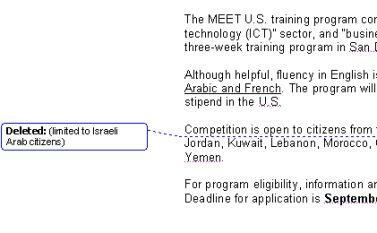 Why must Americans living in trailer parks subsidize Middle East Entrepreneur Training? It’s absurd. The MEPI State Department application for MEET is here and here. You’d think this story would be all over our news–our mainstream media–but you’d be wrong. We are losing the battle on many fronts. 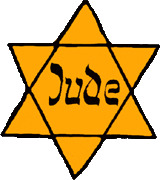 While Muslims shun birth control and have six kids, Jews are slowly dwindling down in population. The same can be said about white americans in this country. Their fertility rate is declining, and the only reason America maintains the replacement fertility rate is because of hispanics and other minorities. Jews need to start having more children. I think the best thing you can do in honor of your father who passed away is to get married and have children. Its not too late. We can’t embrace a feminist and secular outlook. I know why the state department relaxed their bigoted rules. Stewart Ain a reporter for the New York Jewish Week found out about the story and while everyone else was calling the University–He spoke to the person at the state department who was responsible for the program. She denied the anti-Jewish policy and said to call back . He called again Monday and she apologized and said she hadn’t known about the bias until his call and the problem has been fixed. Ain continues his investigation and has told me stuff that blew my doors off. There will be more to come by mid next week. I’ve always wondered why America gives millions of dollars of aid to Arab countries. Can’t Saudi Arabia foot the bill? Does Saudi Arabia have a national deficit in the gazillions? This story is making the rounds through the blog world though I have not seen it in a major media outlet yet. I saw it on Little Green Footballs (thanks to all who submitted it). It’s really pathetic and shameful that the MSM hasn’t reported the story at all. So who is the xenophobe NOW, huh??? Or is xenophobia only applies to discrimination against muslims?